The Space X company made history as its Falcon 9 rocket rose from its seaside launch pad and pierced the pre-dawn sky, aiming for a rendezvous in a few days with the space station and launching the commercial space era. It is the first time a private company has launched a rocket to the International Space Station. The unmanned rocket carried into orbit a capsule named Dragon that is packed with 1,000 pounds of space station provisions. "Falcon flew perfectly!!" SpaceX's billionaire founder, Elon Musk, said via Twitter. "Dragon in orbit … Feels like a giant weight just came off my back." 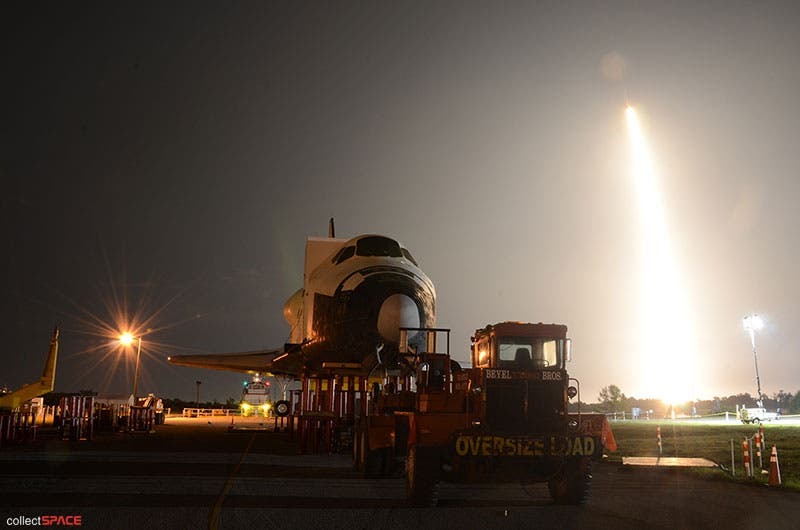 NASA is betting on the switch from government to commercial cargo providers in the U.S., now that the shuttles no longer are flying. Astronauts could begin taking commercial rides to the space station in three to five years, if all goes as planned. The real test comes Thursday when the Dragon reaches the vicinity of the International Space Station, where it will undergo practice maneuvers from more than a mile out. If all goes well, the docking will occur Friday. Musk will preside over the operation from the company's Mission Control in Hawthorne, Calif., where he monitored the liftoff. In many ways, this epic event mirrors a similar shift back in the 1970's and 1980's as the emerging computer industry shifted from government and DARPA funding to private equity funding ushering in the desktop, Internet, and mobile eras.